I’ve battled chronic anxiety and PTSD my entire life and am no stranger to that tight pressure grip that dread and panic can have on the body and mind. On my worst days, I’d feel my chest and throat tighten as I struggled to breathe. Chronic panic attacks would leave me curled up in the fetal position, unable to move or stop panting. On my best days, I’d manage to get by, thanks to my numbing out with food and alcohol, self-medication, or mindless TV watching. I wasn’t just battling anxiety; I was in denial about the low-grade, high-functioning depression that, like a dark little storm cloud, hovered over me from the time my eyes opened in the morning till I finally fell asleep at night. I tried everything I could to shake it, to blow past the inner turmoil that never seemed to stop churning. I couldn’t make it stop, and I couldn’t make it go away. Some things I tried provided brief momentary relief or comfort, though eventually, the feelings of dread, fear, defeat, and overwhelm would resurface yet again. I felt trapped. Powerless. Out of control. Doubtful I’d ever be able to experience anything other than this miserable existence. I come from a long lineage of various family members with a history of mental disorder and addiction, so I guess you can say it’s in my blood. As a young child I grew up witnessing my mother struggle with severe depression, bipolar disorder, and substance abuse problems, all of which eventually led her to several meltdowns and even a suicide attempt. So naturally, I was an anxious and fearful little girl who often felt very unsafe. My young mind learned early on that in order to survive I had to constantly be on guard. As my way to cope and make sense of it all, I sought out things that would help me feel in control of myself and my life, even if I accomplished this by numbing out, distracting, or shrinking and playing small. It wasn’t until I embarked on the yogic path that things really changed for me. I turned to yoga in search of answers and natural anxiety relief during one of the lowest points in my life. I found comfort in this ancient practice, which taught me that I am not my past and I am not where I come from. Thanks to my yoga practice I realized that my anxiety didn’t have to define me. I learned that I could indeed rise above my fears, even in the midst of a full blown panic attack. I could learn to calm my racing mind and hyper-aroused body by learning to control my breath. This is one of yoga’s cornerstone teachings and it’s called pranayama or yogic breathing. It wasn’t easy to employ these techniques in the middle of an attack, but with practice, time, consistency, and dedication, my panic attacks gradually shifted. They lessened their hold on me. I haven’t had a panic attack in almost three years. Each time I’d feel the onslaught of an attack, it took everything I had in me to channel my inner yogic warrior and brace myself for the internal battle about to take place. “I am not my fear; I am not this panic,” I’d remind myself over and over again as I struggled to breath. 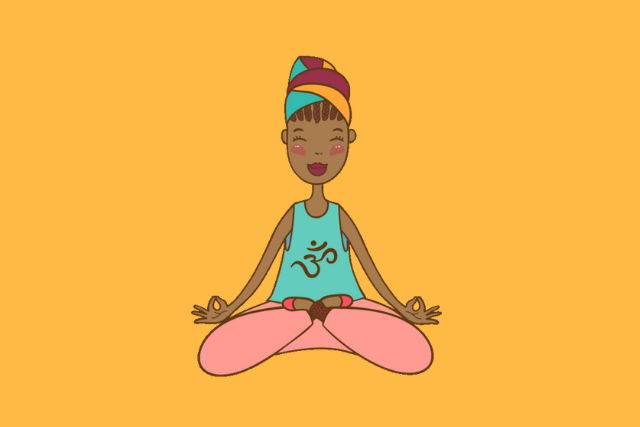 I used various yogic breathing techniques each time I needed to calm my panicky mind and body. One proved particularly effective, so it became a go-to. It’s a science-backed technique called Ujjayi Breathing, also known as Warrior Breath and Victorious Breath. When you practice Ujjayi you create a sound like the ocean’s waves or an animal’s hiss by gently constricting the back of the throat. It sort of sounds like Darth Vader in Star Wars. Various studies have indicated that Ujjayi can be effective in working with PTSD. It’s been used with Vietnam veterans and natural disaster victims. When paired with deep abdominal breathing, Ujjayi can help you deactivate your body’s panic response while activating the soothing, regenerating response. The wave-like sounds of this breathing exercise can also provide you with some much needed soothing in the middle of the storm. Just a few minutes of Ujjayi breathing can offer you a welcomed sense of control as well as a wave of calm groundedness. In the throes of a panic attack, your body and mind can feel completely out of control. Your breath tends to be short, shallow, and frantic, so it’s important and essential to do what’s in your power to regain control by shifting your breathing. Start to slow your breath down intentionally. – Place the tip of your tongue on the center of the roof of your mouth, keep it there. – Breathe only through your nose. – Take a full exhale with the mouth closed. – Start breathing like the ocean—constrict the back of your throat as you inhale slowly for six counts and exhale slowly for six counts. – As you’re inhaling, engage the lower belly by expanding it outwardly. – As you’re exhaling, contract the lower belly by bringing it inwardly toward your spine. – Keep repeating this breathing pattern of inhaling for six and exhaling for six until you feel a shift in your body and you’re no longer struggling to keep the pace (preferably a minimum of three minutes). Once you’ve gotten control of your breathing rate with Ujjayi, start to bring awareness to your breathing. Bring your entire awareness to your breath as the air flows into your nostrils and out of your nostrils. Follow your breath with total attention. Observe your breathing. Is it long? Let it be long. Is it short? Let it be short. If the mind wanders, bring it back to your breath. Follow the breath and watch it with full presence. This is an excellent mental training that will get easier and easier the more your practice. Once you’ve connected to your breath and have brought awareness to it you’re ready to notice what is coming up for you and name it. A recent study out of UCLA found that the simple act of mindfully naming or labeling our emotions has the power to lessen their intensity. The study looked at brain scans of subjects as they named emotions and found that the part of their brain associated with fear and reactive emotional responses actually became less active. So name what you’re feeling and don’t hesitate… Name “fear,” “panic,” “dread,” “anger,” “scared,” “anxious,” “worried,” “resentful,” and so on. With each inhale and exhale keep making the ocean’s sound and find your flow with it. Imagine the waves ebbing and flowing around you as you breathe the waves through you. Feel the waves within you. The more you flow with the waves, the more you’ll dissolve panic and activate inner calm.